In the 1960s, there occurred amongst Latin American writers a sudden explosion of literary activity known as the ‘Boom’. It marked an increase in the production and availability of innovative and experimental novels. But the ‘Boom’ of the 1960s should not be taken as the only flowering of Latin American fiction, for such novels dubbed ‘new novels’ were being written in the 1940s and 1950s, as well as in the 1970s and 1980s. 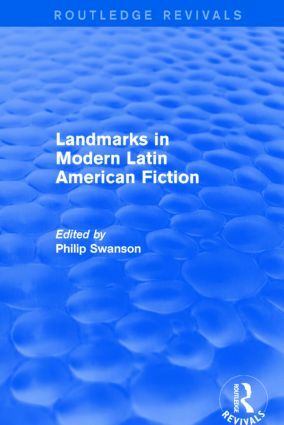 In this edited collection, first published in 1990, Philip Swanson charts the development of Latin American fiction throughout the twentieth century. He assesses the impact of the ‘new novel’ on Latin American literature, and follows its growth. Nine key texts are analysed by contributors, including works by the ‘big four’ of the ‘Boom’ – Fuentes, Cortázar, Garcia Márquez and Vargas Llosa. This book will be of interest to critics and teachers of Latin American literature, and will be useful too as supplementary reading for students of Spanish and Hispanic Studies. It will also serve as a helpful introduction to those new to Latin American fiction.